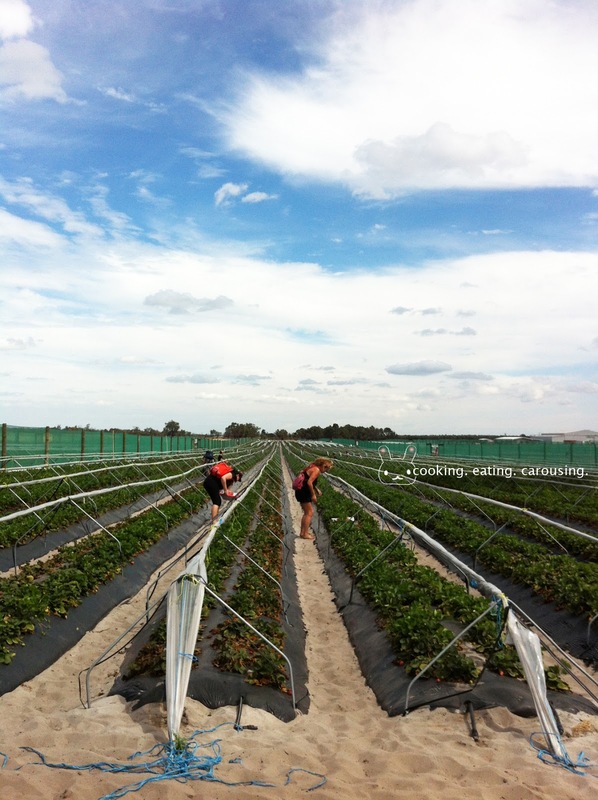 I went strawberry picking on the weekend. 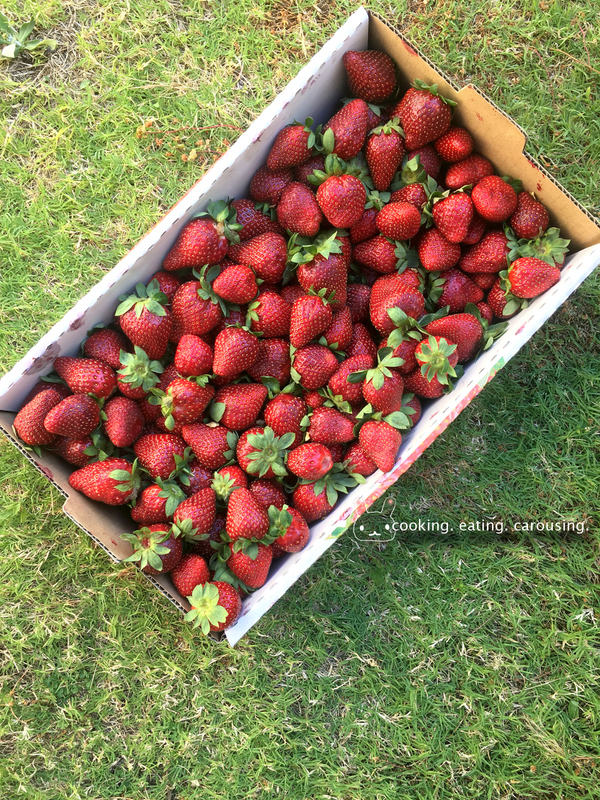 There's not a lot of Pick-Your-Own (PYO) farms here in Perth, which makes me all the more excited when strawberry picking season finally arrived. The season starts in September and ends sometime in November/December. I'd keep an eye on the farm's facebook page, they update it pretty regularly during the picking season. The farm I went to is called Ti Strawberry Farm in Bullsbrook, about 40 minutes drive North of Perth. 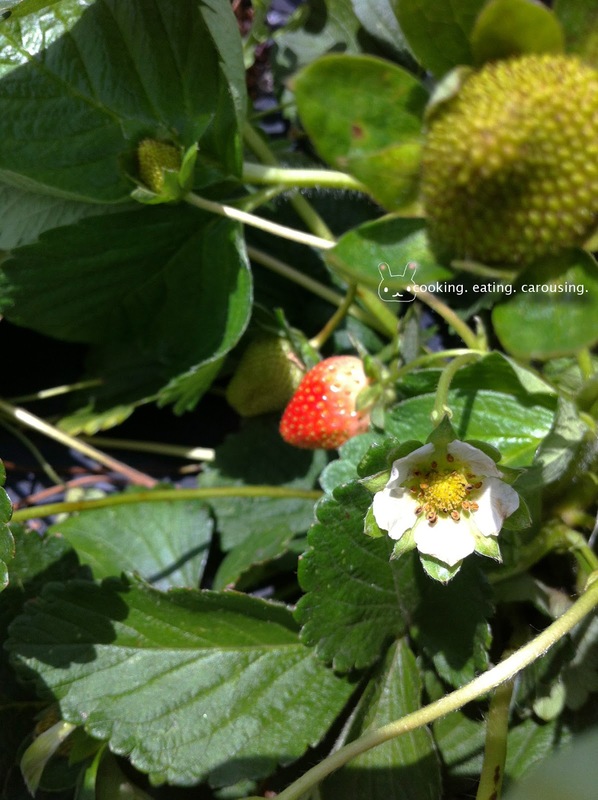 Most of the strawberry varietal grown here is the Camarosa, but they do have a mixture of different types of variety. The day I went was a cloudy breezy day, which helped a lot. When the clouds moved and the sun was bearing down, it was unbelievably hot. I had a lot of fun, but it can also be hard work. Here's a few handy tips that might help when you go off to do your own picking. Tip no. 1 Check the weather. 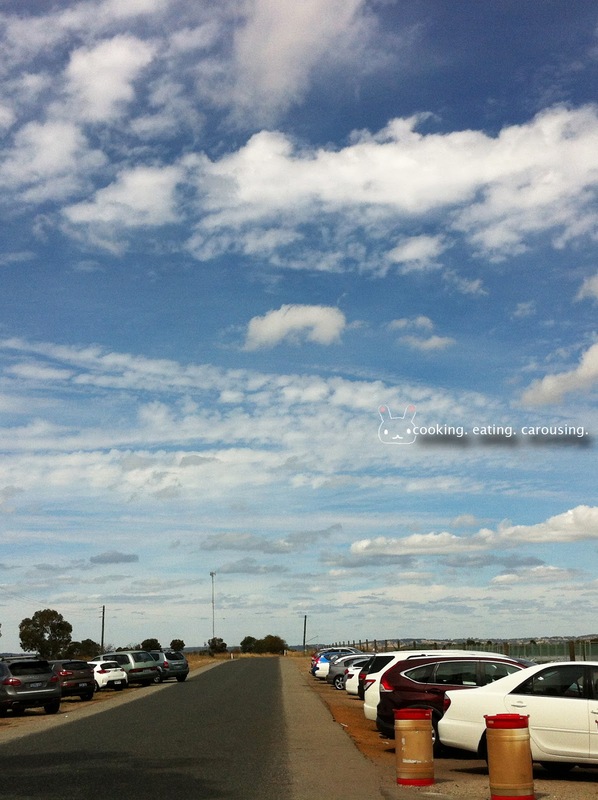 Go earlier during the day when the weather is still relatively cool. There's plenty of verge parking. Drive slowly when you get there as there are a lot of kids running around. Though there were a lot of people when we were there at 11am, the crowd thinned out considerably at noon, maybe because of the heat, maybe because a lot came earlier in the morning? Tip no. 2 Check the school holiday weeks, if you want to avoid the crowd. You can buy the tray for the strawberries from the makeshift tent, located inside the gate. One tray can hold about 5 kg, and if you're ambitious 6 kg. There are two lovely ladies manning the counter. A tray costs $10, which includes 1 admission fee. Extra admission would be $2 per person (applies to kids as well as adults), with a maximum of 5 people per tray. If there are 6 of you, you have to buy another tray. When I went in 2017, a tray now costs $10 on its own, and the entrance for every person is $2. I must admit the price keeps increasing every year. I may consider giving this other farm a try next year, their price is $7 per tray, $12 for 2 trays, with no entrance fee. Apparently there didn't use to be a toilet in the premises, I don't know what people had to do when they really needed to go. 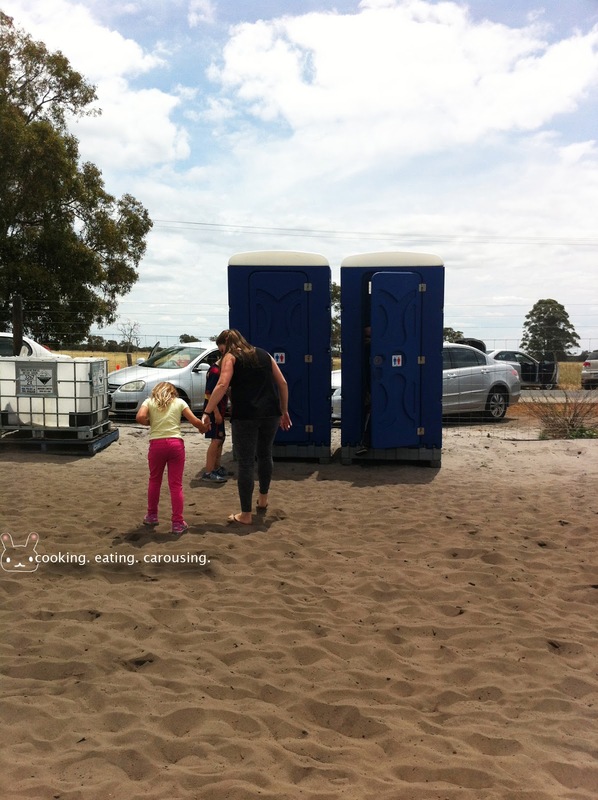 Fear not, this year, they have two portaloos installed on site. I haven't tried using them myself, but you probably won't be picky with cleanliness if you really needed to go. 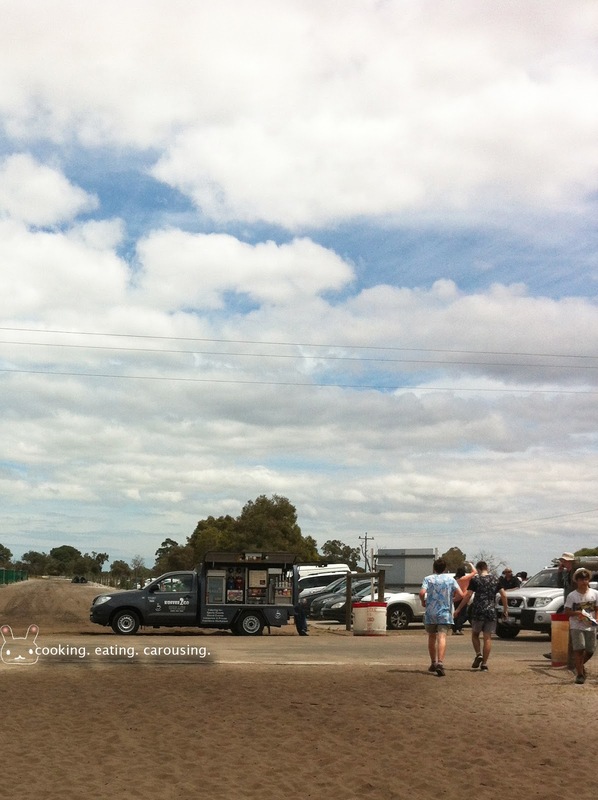 There was also a coffee truck parked at the premises when I arrived at 11am. I am supposing it's for those who were there in the morning. The truck disappeared by 2pm when I left. This year they have an on-site kiosk that sells smoothies and ice creams. Tip no. 3 Wear proper attire and sun protection. I myself wore a very stylish print long pants (a style I call "ajumma farm fashion"), long sleeve shirt, wide brimmed hat and my trusted Hunter wellington boots. If you aren't in possession of a pair of wellies, I recommend a pair of your dirtiest sneakers. The farm is very sandy and your clothes and shoes will have sand all over and inside out, so don't wear your best clothes. I also brought with me a small hand towel to wipe my face when I'm sweating. It's also a good idea to bring some fly nets with you, they can be atrocious. I see that some people are wearing singlets, shorts and sandals. Unless you're intending to get a tan going, I would highly not recommend it. The first half hour of picking, I didn't really do much picking. I was busy taking pictures of all the cute strawberries. There are green and pink and red ones. There are even sun-dried ones! I can hear bees (and flies) buzzing around me. But I didn't manage to take a picture of one. Tip no. 4 If you're allergic to pollen, drink an antihistamine tablet before you go. You'll thank me for it. I have a soft spot for the "ugly" ones. Ones that don't necessarily look textbook. If they're red and ripe, I didn't hesitate to pick them. They're like the kids that always get picked last at the playground and if I don't pick them no one would. This one, though cute as it might be, is not quite ripe yet. Tip no. 5 Bring a pair of garden gloves. 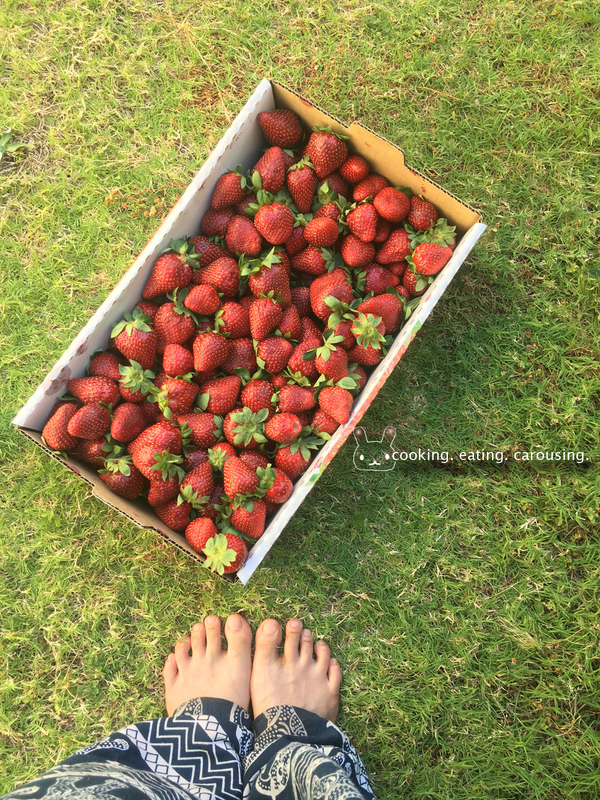 Halfway through the picking, I discovered that the reddest, ripest, largest, sweetest strawberries are hidden from view. It was deeply satisfying peeling open the green curtain of leaves to find these huge red beauties staring back at me. Rummaging through the foliage means you'll need your sturdiest pair of garden gloves. I didn't have one with me, and by the time I finished picking, my hands were a bit itchy. Tip no. 6 Bring snacks and plenty of water. And, don't forget to enjoy your hard work! The night before picking, I froze some water in a couple of bottles. And in the morning topped it up with some water. 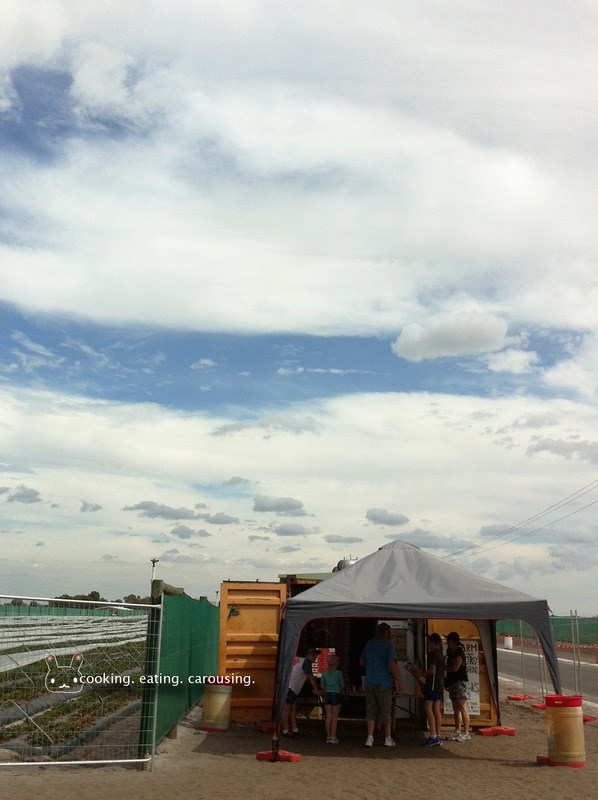 Eventhough the weather was cloudy that day, picking strawberries was still hard work, the water really cooled us down a lot. 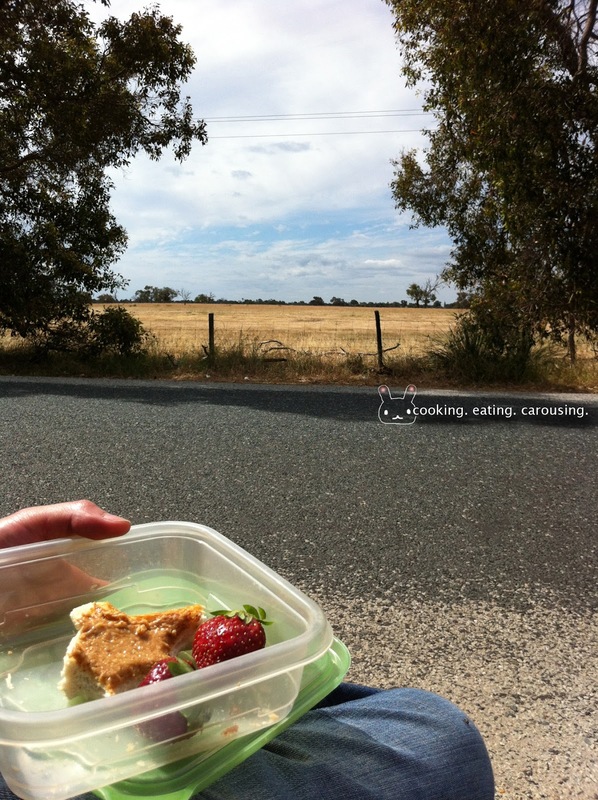 When I finished picking, I opened the trunk of our car, sat on it while I enjoyed the breeze and the view. After a few big gulps of the icy cold water, I was ready for lunch. You know the classic combination peanut butter jelly sandwich? A couple of weeks ago I made myself some roasted almond butter at my sister's place -- she has a thermomix, it took me 10 minutes to make, which otherwise would have taken me half an hour with my food processor and even then the result wouldn't be as smooth. I brought some almond butter sandwiches, and I ate them with a couple of the strawberries I just picked. The strawberries were the sweetest and juiciest strawberries I've ever had, almost as sweet as jam. My theory about that is, the strawberries you buy from the store are slightly under-ripe because they need to have a longer shelf life. Whereas the ones I just picked will probably go off in a few days. So what can you do with all these strawberries?! They're sweet, they're ripe, and they're going off fast! Here's a couple of ideas, all of which I did over the weekend. I did go a bit stir crazy with strawberries. I even saw them in my sleep. 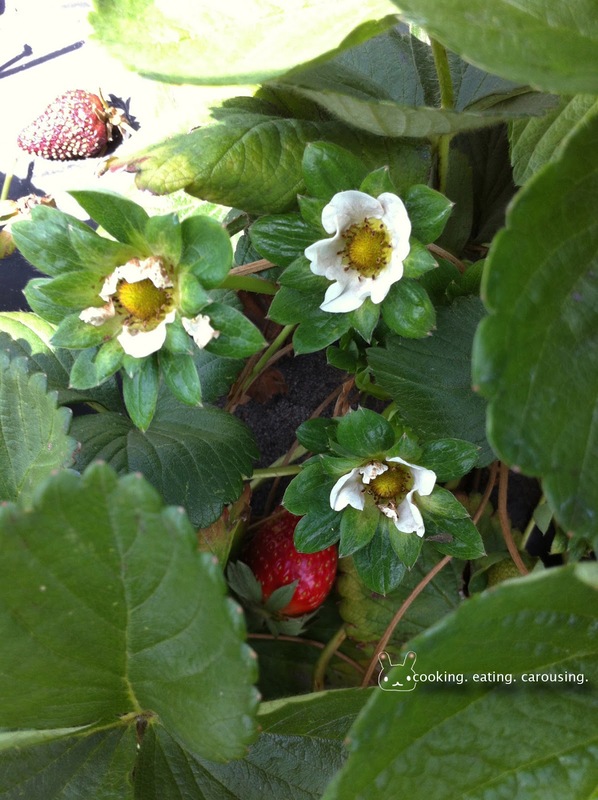 When I arrived home I started by separating the bruised from the non-bruised strawberries. 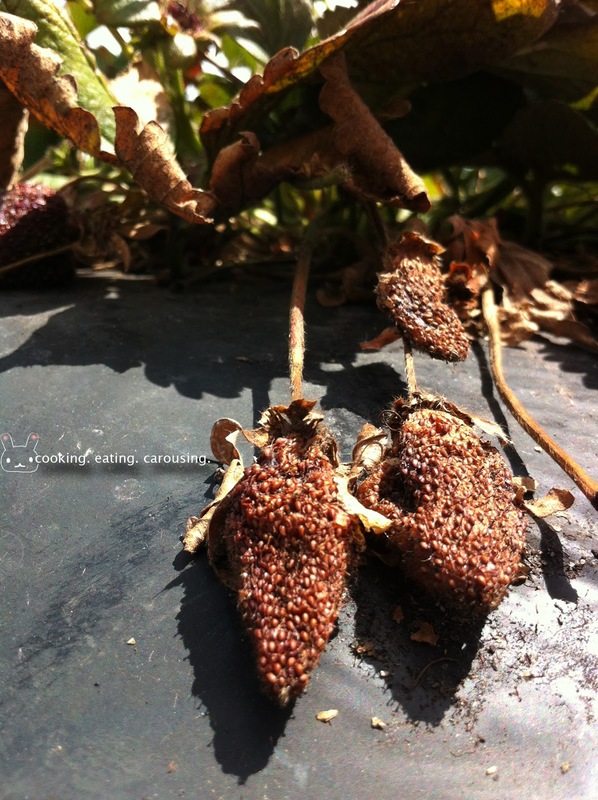 The non-bruised ones, I pack into containers unwashed and gave them to my family, friends and neighbours. Washing strawberries make them mushy and they won't keep as long then. For the bruised ones, I dumped into a washbasin filled with water. A lot of dirt and sand and dead leaves settled to the bottom while the strawberries floated to the top. This brings me to another tip. Tip no. 7 Bring an eski that the strawberry tray can fit in. 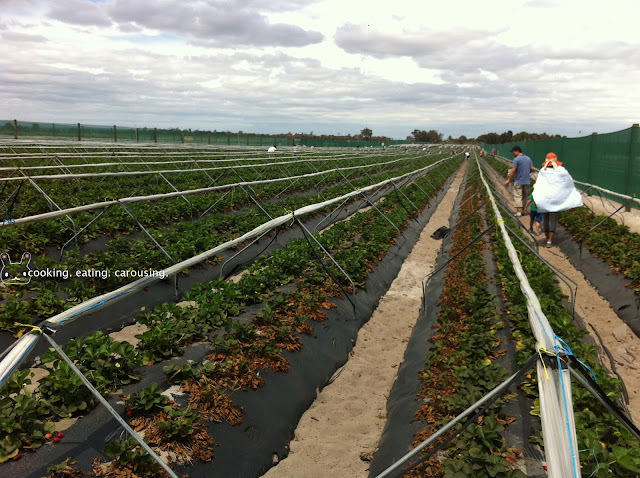 This will ensure your strawberries are transported home with minimal bruising. Tip no. 8 Go picking in the later months, or as late as you can bear it (the later you go the hotter it is). 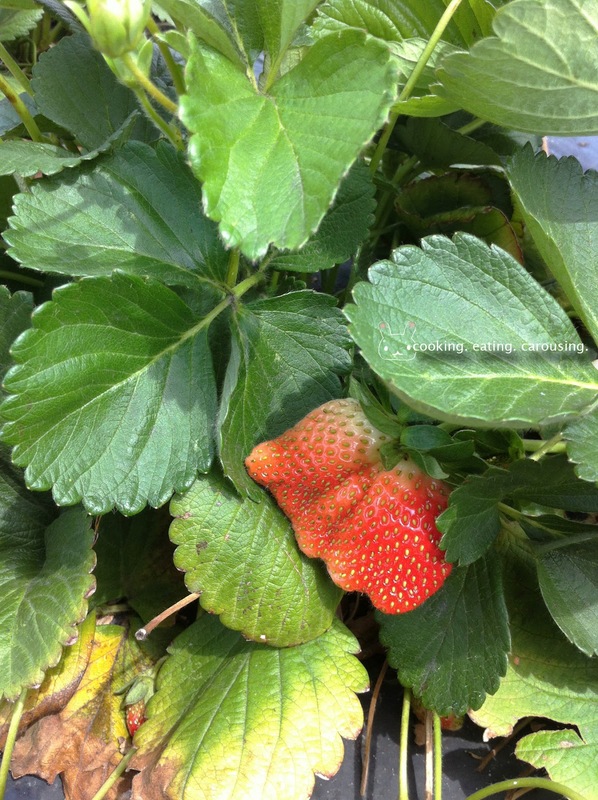 Ti Strawberry has been open for picking from as early as July. 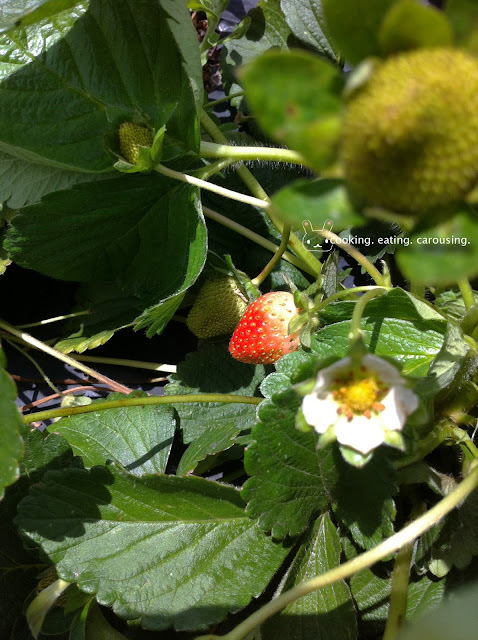 I have been going strawberry picking for three years in a row now. 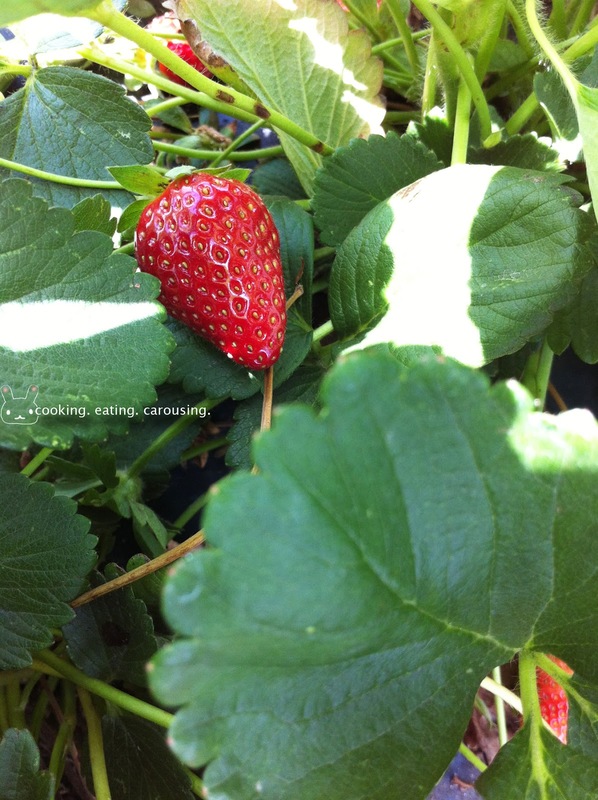 In 2015, I went picking in November, the strawberries were so sweet, with not a bit of sourness. 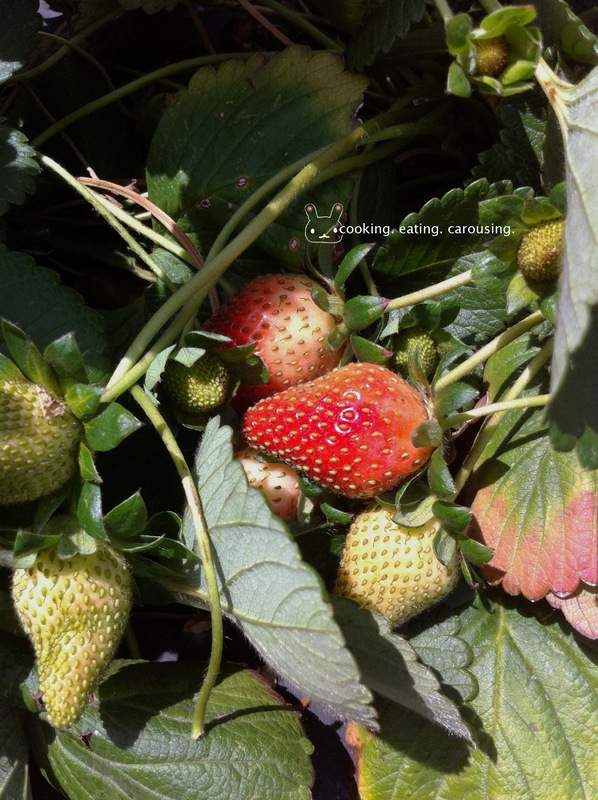 In 2016, I went in October instead, I had to work real hard to find the overripe, sweet strawberries I dearly love, and in the end, only a small amount are, the rest of them were disappointingly sour like store-bought ones. 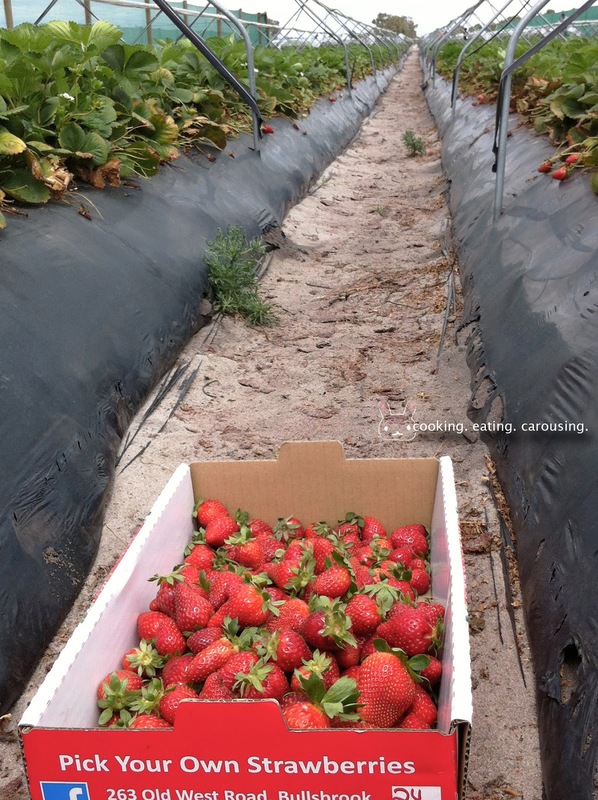 This year, in 2017, Ti Strawberry made a couple of changes, they're open everyday for strawberry picking (instead of just weekends), and they expanded the farm. I decided to go in November again, as last year's October harvest was disappointing. I checked their facebook page the night before I went picking, it said they're opening a new section of the farm for picking that weekend! 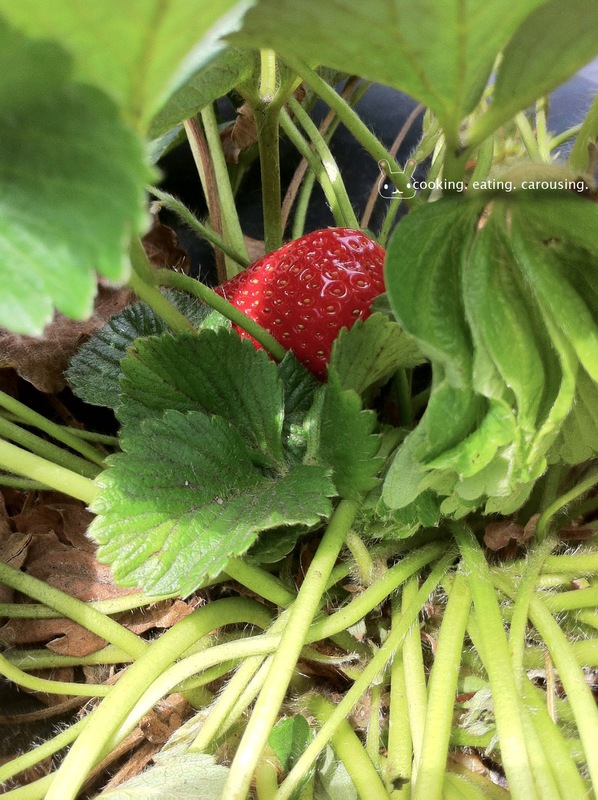 The reward: red overripe strawberries were to be found effortlessly, so sweet and juicy, and the crowd considerably thinned out from last year so I could pick in peace. A couple of pictures of the harvest this year. My sisters have taken as much as they wanted, yet there was still a lot left for me to do as I please. Do you see how deep the red colour is, from head to toe, no pink or white colour in sight. For the recipes below, I used up the bruised strawberries first before using the non-bruised ones. Let's start with an easy one first, frozen chopped strawberries. Hull the strawberries. Chopped them up and layer on a baking tray on a single layer. Cover with cling wrap and freeze for at least 24 hours before transferring them into a plastic container. They're very convenient. You can make strawberry milkshake with it, or topped your oats with. Strawberry syrup keeps for a long time. You can use it to make a glass of refreshing strawberry soda, or even better, to make this giddy Indonesian drink, soda gembira. You can't go past strawberry jam. I've collected a few used jars from when I bought sauces from the shop. Some of the jars have lids with a seal indication that pops up if the jar isn't sealing properly. These jars are safe to re-use for high acid foods like passata and jams. I used them for a batch of homemade strawberry vanilla jam. 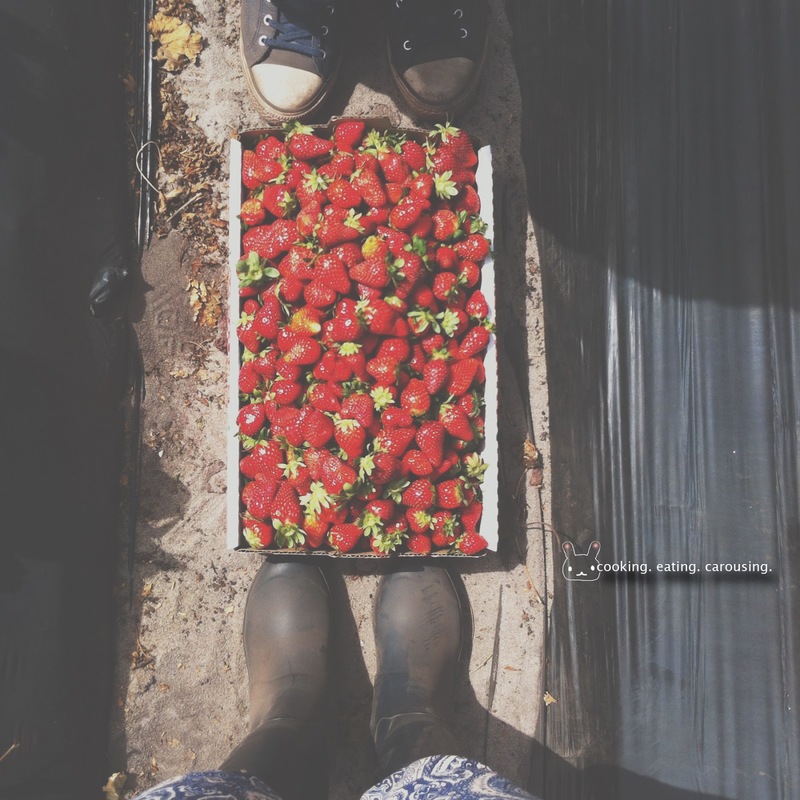 Strawberry preserve. I haven't made this yet, but this looks so much easier than making jam. I'll attempt to do this today. Strawberry bread. I made this with walnuts instead of pecans. I crushed the fresh strawberries by hand before adding it to the batter. And I only used 1/2 cup of sugar because I feel that if I used the recommended amount of sugar, what comes out will be a loaf-shaped sweet strawberry muffin, instead of strawberry bread. The half cup sugar I used, means the bread came out only with a tiny little hint of sweetness. The strawberries provided it with tangy surprises. You definitely cannot omit the nuts as they gave the bread some much needed texture. 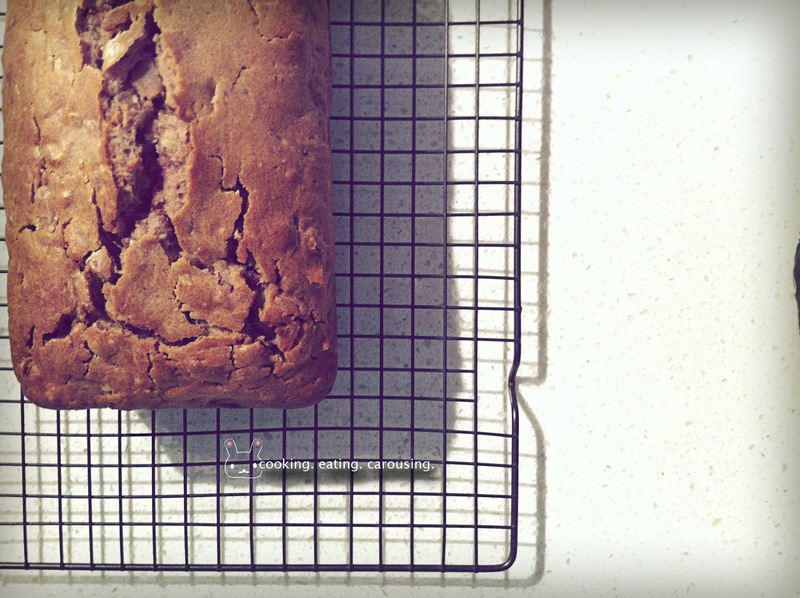 The bread didn't come out as pink as the original blogger's, so I think to remediate this, what I would do differently next time is to substitute the sugar with 1/2 cup of my homemade strawberry syrup instead. Strawberry fruit roll-ups. As the strawberries I picked were so sweet, I didn't add any sugar, it's easy to make and satisfying to know these fruit leather are made of 100% strawberries with no added sugar or nasties. I haven't made these ones, but they're really creative and inspiring. Who wants boring cinnamon rolls when you can have strawberry cinnamon rolls. Lucky last is a japanese mochi recipe called daifuku using whole strawberries. Website link here, facebook link here. 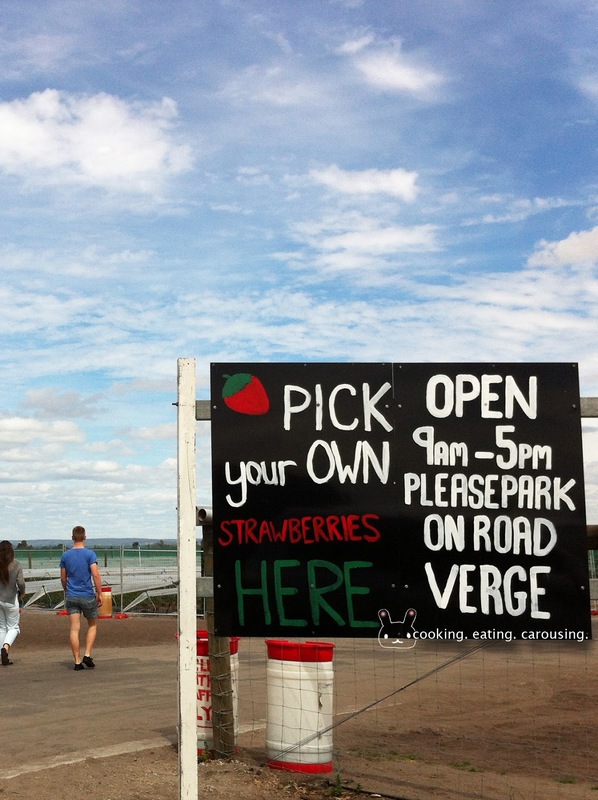 You'd better pick the right time to go strawberry picking, or they won't have any left for you, or it'll be too crowded! 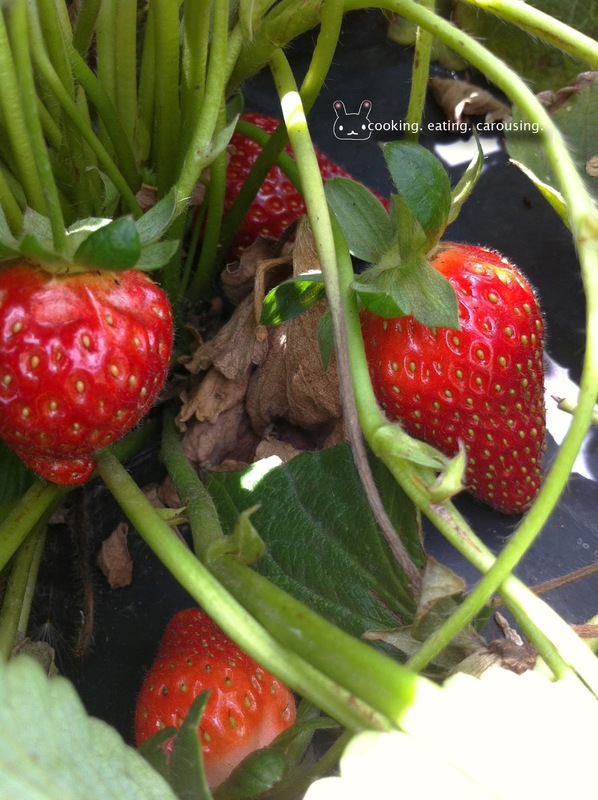 And if you're intending to make something with those strawberries, make sure you have extra in storage at home! The extra storage tip is a sound one, another tip is don't wash the strawberries before storing in the fridge, it makes them mushy. Only wash just before you eat.